Have a WHOLE lotta fun at Whole Foods! Who doesn’t love Whole Foods? You walk in that place and you just FEEL healthier! There is always something new and interesting to see, taste or try. I hate grocery shopping as a rule, but Whole Foods is like a trip to a funhouse for me! So I was uber-excited to stumble onto their Kids Can Cook Too! classes. I get to be the cool mom, Parker gets to have fun and learn a little (remember, my goal is to have her on KP duty as soon as possible) and afterward I get to stroll around and buy some yummies. We just got back from today’s class at the Norwood store (the Mason location has these classes as well). Today’s menu? Raw Berry Crisp (like an unbaked cobbler kinda)…fresh berries topped with a nut, oat and date crumble. It was quite tasty and totally guilt free! But far more than the dish the kids got to make was the tour through the store with Sarah (today’s Top Chef). She showed the kids where they could find all the ingredients for the dish they were about to make and introduced them a ton of new tastes: dried dates; fresh lychees; dried and fresh figs; and a bunch of various nuts. Now I can tell you if I offered P a fresh fig she would laugh at my absurdity and run screaming for the hills. Heck, I could serve it on a silver platter dipped in a pound of chocolate and covered in sprinkles – it would still be a NO GO. But somehow Sarah got all the kids to try the stuff. Sarah might have magical mind-melding powers now that I think of it. She showed them how Whole Food’s fresh nut butters are made – and they got a nibble of almond butter with their crisp. P didn’t offer to share the almond butter, so I’m thinking it must be pretty good. You know a kid’s class is great when you walk away learning something and I learned a ton. Til today the only exposure to figs is via fig newtons. 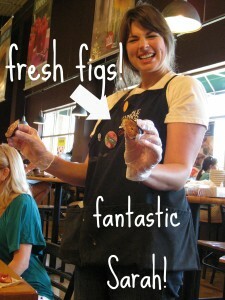 And real figs are so much better than their cookie counterpart! 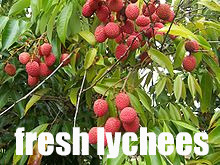 And fresh lychees – peculiar but delicious, try some one of these days. Kids Can Cook Too! classes are held at 10am nearly every Saturday at most Whole Foods locations. There is no cost for the classes, but you do need to register for them. 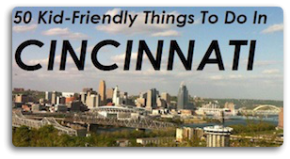 Check their sites (Rookwood or Mason) for all the details as well as upcoming menus. We’ll see you at the Rookwood store next Saturday for TACOS!! I can’t believe we have never been here! Both of my boys love to cook. We love Whole Foods. My youngest just finished a cooking camp at the Mason store and she was also eating things she’d never try with me. I wish I could bring the instructors home with me but I don’t think they’d go for that. lol.